Country music rules on AXS TV, as the network presents the “Have A Willie Nice Day” marathon—an all-day event featuring classic concerts and candid interviews from some of the genre’s most influential artists, starting Sunday, June 25 at 8 a.m. E/5 a.m. P.
The day begins with Dan Rather sitting down with three Country superstars to discuss their personal lives and legendary careers on THE BIG INTERVIEW, featuring in-depth conversations with Loretta Lynn at 8aE, Kenny Rogers at 9 a.m. E, and Dolly Parton at 10 a.m. E; followed by an intimate look at the tremendous impact of the Man In Black in ROCK LEGENDS: JOHNNY CASH at 11 a.m. E. And AXS TV gives viewers the ultimate front-row seat as music heroes Willie Nelson, Neil Young, John Mellencamp, Dave Matthews, and more come together to raise funds and awareness for America’s farmers in FARM AID 2016 at 11:30 a.m. E.
The block continues at 1 p.m. E with two more episodes of THE BIG INTERVIEW, opening with Rather’s powerful interview with Merle Haggard as the late Country icon discusses his legacy and what drove him to keep performing, before delivering an emotional rendition of his signature hit “Sing Me Back Home.” Next, at 2 p.m. E, Nelson opens up about the positive effects of his benefit concert, Farm Aid, on American agriculture; as well as the importance of buying local, and why he decided to get involved in the marijuana business. And AXS TV puts the spotlight on three epic concerts with WILLIE NELSON LIVE at 3 p.m. E, followed by a pair of show-stopping sets at “The World’s Largest Honky Tonk” in LIVE FROM BILLY BOB’S: MERLE HAGGARD at 4 p.m. E, and LIVE FROM BILLY BOB’S: WILLIE NELSON at 6 .p.m. 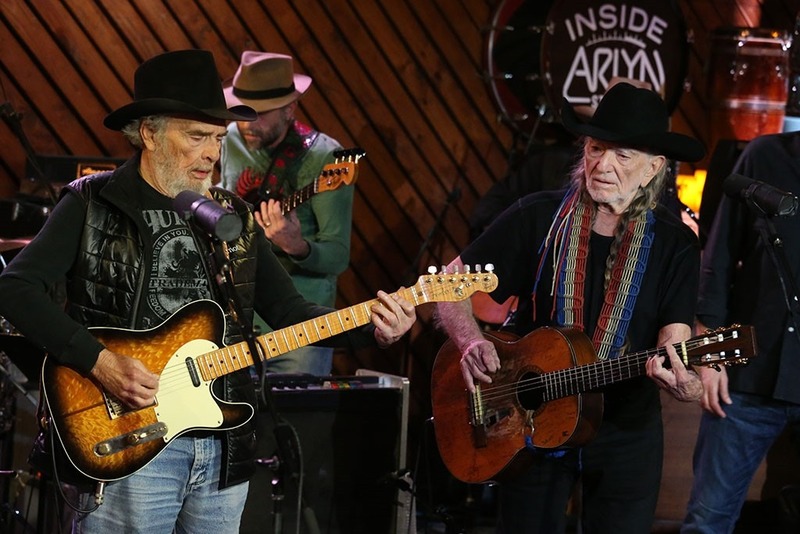 E..
Then, stay tuned at 8 p.m. E for the premiere of AN INTIMATE EVENING WITH WILLIE AND MERLE—a landmark event that offers a rare glimpse at one of music’s most legendary friendships, as Willie and Merle enter the studio to record their final album together before taking the stage for one of their last joint performances. Filmed live at Arlyn Studios’ candle-lit drum room, the film captures the Country heavyweights at the top of their game, trading witty banter as they deliver spirited renditions of Nelson’s “Roll Me Up And Smoke Me When I Die” and “On The Road Again,” Haggard’s “Okie From Muskogee” and “Fightin’ Side Of Me,” collaborative tunes “A Horse Called Music” and “Pancho And Lefty,” and many more. The night closes at 9 p.m. E, with a star-studded salute to the definitive Country icon George Jones, in GEORGE JONES: 50 YEARS OF HITS featuring performances by Jones, Kenny Chesney, Wynona Judd, and Randy Travis, among others; followed by an encore broadcast of AN INTIMATE EVENING WITH WILLIE AND MERLE at 11:05 p.m. E.